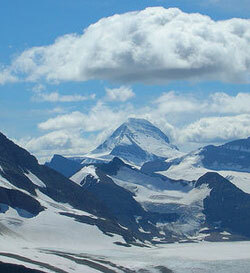 Mount Sir Alexander dominates a group of peaks and an icefield of approximately ninety square kilometres in area. 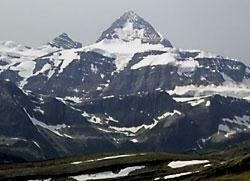 The group of mountains is said to mark the northern limit of the "continuously alpine" section of the Canadian Rockies. Samuel Prescott Fay, who named the mountain, was Charles Fay's cousin. Charles was a noteable figure in the early climbing history of the Canadian Rockies. Fay first saw the mountain 1n 1912 from a summit near the head of Sheep Creek. He wrote, "About twenty-five miles, possibly thirty, in a direction northwest from us was a vast region of snow and ice that immediately attracted our attention. From the midst of this rose two high mountains, one of which appeared to be of great height. . .It rose above all the surrouding peaks, presenting a bautiful sight as its ice-covered summit glistened in the clear September sunlight." In August, 1914, Mary Jobe and Margaret Springate visited the area with guides Curly Phillips and Bert Wilkins. They ascended the north glacier to an altitude of 7800 feet. Curly returned the following summer, again with Mary Jobe, coming to within 100 feet the summit with Frank Doucette and John C. Tyler before being stopped by an overhanging cornice. Mary Jobe originally used the Cree word "Kitichi" word for the mountain. It means "mighty."